The Irish Peatland Conservation Council (IPCC) are asking for your help to bring part of Girley Bog, Co. Meath back to life. This Wednesday, the 27th of May, you can volunteer with the IPCC to restore an area of cutover raised bog with Sphagnum mosses, in order to mitigate against the effects of biodiverstiy loss on the site. The day will involve full training of all volunteers in the Sphagnum moss transfer method as well as a hands-on practical demonstration of the method on site. 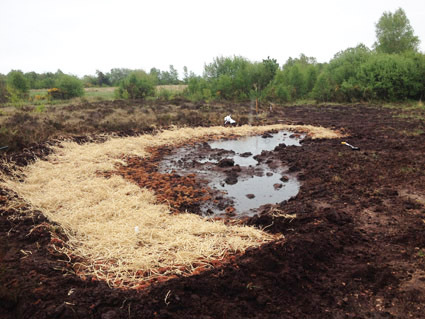 At the same time as learning a new skill you will be helping IPCC in the their attempt to restore peat forming conditions to a degraded portion of Girley Bog NHA. Girley Bog, just south of Kells in Co. Meath, is a stunning raised bog and one of the most easterly examples of this rare and unique habitat. The site is worth a visit at any time and IPCC are looking for your help in making it even more so. The day will run from 10am until 4pm and waterproof boots, rain gear and lunch are required. The meeting point for the day is Causey Farm, Fordstown in Co. Meath (on the R164 east of Girley Bog). For more information please contact Tadhg at the IPCC on 045 860133 or bogs@ipcc.ie. This event is kindly supported by the IEN Biodiversity Fund 2015. This entry was posted in News and tagged Activities, Attraction, BioBog, biodiversity, Events, Girley Bog, Things to Do, Visitors, Volunteer. Bookmark the permalink.